After the big weekend I took Monday off. Jodie and I went to the Labor Your Legs 5K and volunteered. I had packed our bikes into the truck because I thought we would be course monitors. We instead rode sweeper. It was a nice leisurely 3.1 mile ride. Well, I have finally circum to the effects of the summer heat. For the past week I have been suffering from what appears to be ‘prickly heat’. Yeah, I did not know what it was either. You see, I started getting an itchy rash on my legs and the back of my knees. It was very aggravating. I would scratch at these bumps and they would become welts. They would get huge – like chicken pox. I thought that it was because of dry skin or something like that. I made a mistake and started applying various lotions to help soothe the irritation. The prickly heat rash has now spread to most of my body. In researching this aliment I have discovered that it is from overused and blocked sweat glands. 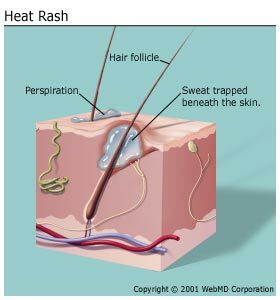 The sweat glands still produce sweat but it can not escape and the sweat forms these little pockets below the skin – gross. The only remedy is time, staying dry and keeping cool. I am already taking lots of cool showers (about 3 per day) but I have added a couple of cool baking soda baths to the mix. I am also applying a lot of baby powder to keep dry. The weather this past weekend was much cooler so I don’t think that posed too much of a threat. However, during lunch I have been staying indoors. I have been running my 6 miles on the indoor track. Talk about boring. The track is only an 8th of a mile so 6 miles is 48 laps. Around and around. I skipped the track today at lunch and played a couple of games of racquet ball. Tomorrow I will be back in the pool with Adult Swim, strength training at lunch and then the Wednesday Night ride. Good article. Not read anything on prickly heat before, but I've not had a reason to research it either...yet! I admire you for trying to run the 6 miles on that track...I really do!!! I can't run 100 times to equal a mile...no way. I'd lose count...great job on your perservance. I LOVE racquetball and use to play a good bit years ago. I lost my partner as she moved away and never found a replacement. Now they have closed the only racquetball court (I know of) in Laurel. I probably can't hit the ball across the line any more, it's been so long! That is the most fun and full of complete body exercise anyone can get, if you ask me. Glad to hear someone else enjoys "my" sport, too. Never heard of that but find it VERY interesting. I got a serious rash in Hawaii and thought I was allergic to sun tan lotion... but maybe it was this? I may have blocked my pores and caused the rash to form. I had to go to the ER and get a cortizone shot after I couldn't sleep for 2 days. Good luck with that. Does being in the pool's cool water help it at all? Wow, that's weird and interesting all at once. I admire you for going 48 laps. I get dizzy after running about 20 laps at the track (the one I run on is a 0.3something mile track). Prickly heat is really common. Little babies get it if you overdress them too much and they overheat. They tend to get it on their chest and back though. Nice cool showers and wearing cotton shirts should help heaps. I'd never heard of prickley heat before. It sure doesn't sound very pleasant!